This charming ski home is located in the heart of Old Town Park City, less than half a mile from both Park City Mountain Resort and Main Street. Amenities include private baths and a large TV in each bedroom, an outdoor hot tub, private balcony, gas fireplace, gourmet kitchen and heated 1-car garage. 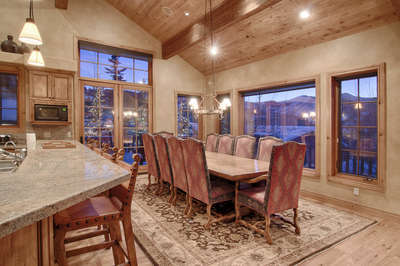 Experience an unforgettable Park City vacation at this beautiful alpine residence. This home is within walking distance to Main Street Park City and has inviting decor, hardwood floors, granite counter tops, a cozy gas fireplace, large TV's, balcony, private outdoor hot tub and heated one car garage. Rental Escapes has partnered with Ski Butlers to offer you the best rental experience in the industry. No more lines. Ski Butlers is a full-service ski and snowboard company that delivers the equipment to you and for a limited time, we are offering a FREE upgrade on the package you select! Ask our agents about this great promotion. Find the greatest snow on earth at Deer Valley Resort and Park City Mountain Resort, two premier ski resorts in the vibrant, historic mining town of Park City. Our distinctive ski-in ski-out private homes, slope-side lodges, and luxury condominiums are situated in the most desirable areas and are the perfect complement to an idyllic alpine escape. You will find delight in this cultured mountain town’s four seasons, whether on the slopes, trails, river, fairway, patio or at one of its celebrated happenings, like the Sundance Film Festival, World Cup Freestyle Competition, Kimball Arts Festival or the Tour of Utah. Enjoy a perfect blend of luxury, adventure, culture and beauty only 35 minutes from the Salt Lake City Airport.